At the time, I’ll admit, this was something of a disappointment. I’d bought all 1998’s other Fatboy singles, and loved the rumbustious unsubtlety of his beat-making. Sly warmth was not what I’d showed up for. Add to that a mistrust of the gospel-sample route born out of the ubiquity of Moby’s Play album that year – a self-conscious marriage of old and new to largely banal effect – and I thought the Fatboy had lost his touch. Returning to it now, I think I was hopelessly wrong. A fourth slice of frenzy might have been enjoyable, but he’d mined that seam well enough. “Praise You” is something richer – a journey back into pop’s recent past, a statement at the end of the decade that the 90s had contributed something marvellous to pop – and that something was the kaleidoscopic intermix of dance music with everything else, a movement that had liberated Cook himself from indie bassist drudgery and had, fleetingly, promised to extend that liberation to any musician or fan who wanted it. By the time that “should” ends, “Praise You” has slid into a loping, loose-fit, comfortably familiar groove, marinated in wah-wah, that could have been put together by Andy Weatherall at the decade’s other end and topped with a Rowetta vocal line or an “Easy Rider” sample. And I realise, delightedly, that I’m listening to the last great baggy record. As such, it has to be a little bittersweet – “Praise You” is joyful, but it’s a weatherbeaten kind of joy. The only indie-dance number one at the front of the 90s was an invitation to the whole world to join England’s party in the sunshine: if even football can get on one, what’s stopping you? The party ended, as they do, and if the 90s can look naively idyllic and lazy from a 21st century perspective, at the time they felt like a long missed opportunity, their idealism front-loaded. From a raver’s perspective, that was particularly true – Cook himself adored playing in front of colossal crowds at festivals or on beaches, a legitimised version of the outlaw outdoor dream that the Criminal Justice Act had killed off. “Praise You” speaks to me as an act of vindication: the parties, the records, the dreams, even the mistakes – they mattered. Like The Streets’ later “Weak Become Heroes”, it’s a fractal record, its function vis-à-vis one night replicated at era scale: “Praise You” is a goofy, end-of-the-party, closer whose happy, weary tone works as well if you’re looking back at a few years not just a few hours. As the song rolls on, a few more old friends come and join the party – a smattering of dumb la-la backing vox here, the tweaked squelch of a Roland TB-303 there. For a few minutes, the doors of pop’s club are opened up again, and anyone might be welcome. Then the piano loop boils to a single note, the sample is left hanging – “I have to praise you…” – and the track simply ends. Go back if you like, draw strength from what you’ve seen and done. Take yo’ praise – then move on. This is another of my earliest pop memories; at a time when the charts seemed (rightly or otherwise) to be dominated by girl- and boy bands who were both looking to a female audience, for us Fatboy Slim represented something gloriously and unapologetically masculine. He was at once the epitome of cool and an embodiment of the particular carefulness, near-obsession, that lies at the heart of nerdiness (and his status as a mixer rather than a pure performer only enhanced that). I never heard a word said against him. Mention should be made of the glorious video, which now feels awfully prescient. A few years later this kind of thing would be happening for real – a group of friends doing a spontaneous guerilla performance and putting it out there on the internet. At the time the medium was very new and these kind of ideas were just starting to happen, which makes the video empowering on two counts – we can’t have been the only people who looked at it and said “hey, we could do that”. And even more than the music itself, the video is a case of the massively nerdy crossing over to become sublimely cool. Beautiful. I genuinely thought this was The Eels when I first heard it. The first time I saw the video, I was in a shoe shop at Broad Street Mall in Reading, and I thought I was watching a dance group outside the shop on the shop’s security camera. Nothing much to say about it really, it’s just a really charming dance track I liked then and still like now. I remember seeing the video on TOTP and wondering what the hell the dancers were supposed to be doing, in hindsight I think it might be the earliest example of a flash mob. This track represented 1999 in my own ’90s’ compilation later that year. Re Moby’s Play, though 4 tracks had been singles by this point, Play was a later release (May 99). What I remember about Play’s ubiquity was it’s eerie delayed ‘at large’ ubiquity in 2000. I absolutely adore this – from the stuttering sample to the nimble baseline – everything feels spontaneous and light, despite it being stitched together from many different sources. I’m really grateful to Tom for making the connection with “baggy”, “Madchester” , and so on, in this track – I’d not considered that before, but it certainly fits…back to those very early Beats International singles (indeed, specifically to those still credited to Norman Cook featuring various artists) – that kind of deceptively-sounding amateur enthusiasm is here, as there. Freedom was just a song by Wham, but we pretend. I was surprised to see this only reached #36 in the US. It certainly seemed like a bigger hit at the time. But this may reflect the compartmentalization of US radio at the time…lots of songs in my demographic that seemed more popular than the charts showed, while songs I never heard of from genres I ignored raced into the top 10 and even all the way to #1. Great song though – now that I think about it, it did seem slightly retro at the time – maybe that’s why I liked it. 9/10. I try and act cool as possible on music forums today talking about how amazing 1990s dance music was, but truth be told most of it I didn’t really discover until several years later as a teenager, at the time it was all about the pop. Fatboy Slim is a rare exception in that I remember everything he did. At the time I loved this, although I thought the video was a bit badly made and cheap – not quite understanding it was meant to look like that. I also remember spending many months trying to work out what Fatboy Slim actually looked like – this being before I could simply Google (we didn’t get internet until March 2000) I thought for ages it was the skinny looking dance leader in the Praise You video (actually Spike Jonze), then when ‘Right Here Right Now’ came out I realised it surely had to be the overweight guy who appears at the end of that video – and indeed is on the You’ve Come A Long Way Baby album cover, so that has to be him! I was a bit disappointed when I finally found out it was a fairly normal looking bloke called Norman Cook. See, this is what happens when you make music on computers: it’s simply much easier to repeat your initial ideas ad nauseam and tart them up with production gimmicks than it is to work them into a proper song. “Praise You” has some good ideas – the bass-line especially deserves mention – but the lyric is rudimentary, and all in all it’s perhaps a third of what it should be. Much easier on the ears than some other entries in the genre I could mention, though, and the (really quite cool) video does a good job in covering its deficiencies. SIX. Heard this on the Radio 1 chart show, loved it, bought the cassingle . It’s baggy, alright but specifically Screamadelica indie-gospel-house baggy, one of the ones without much Bobby G on. 8 for me. Like Tom at the time, I felt this was FBS taking his foot off the gas a bit after the full on madness of Rockerfeller Skank and Renegade Master (a definite 10 and a 9 respectively – two of my keenest WTF radio memories) but I still clearly liked it enough to buy it* which was pretty rare for me when you could get a whole second hand LP for the price of CD single. What did for FBS for me in the end was his releasing the ‘A Break From The Norm’ compilation in (I think) 2001. By then, the big beat sound had aged incredibly quickly and once you could hear cuts like Shake What Ya Mama Gave Ya and Beatbox Wash in their entirety, there was less compulsion to hear them as samples and cut ups. #11 Hey Tommy, leave that (pretty fly) bunny alone. Oh, this is Gay Day January, is it? Don’t think I recall ever hearing them, but of course their extraordinarily comprehensive flyposting campaign was, at least in inner (North?) London quite unavoidable for months. Yes, Gay Dad January indeed. I’d heard the single on Radio 1, NYE. I guess I was still impressed by aimless shouty rock back then (“That’s cool / Aerosmith rule!”). You’re really missing nothing, musically. A girl I fancied saw the Gay Dad CD in my bag and laughed at me until our teacher who was a bit of a middle-aged hipster said ‘what, you haven’t heard of Gay Dad? The band of the moment etc etc’. It was a pyrhic victory. Love the song; hate the video, which I think is arch and twee and sells the track short. I do have to praise it, though, for introducing me to the work of Spike Jonze, who at feature length is a bona fide genius. I saw ‘Her’ a couple of months ago, and several scenes are haunting me still. I started the 1990’s 2 months into my 16th year, and finished it 26 years old so I lived every week of that decade. I loved most of it too, though it wasn’t lacking in fallow seasons in terms of chart music (late ’90 for instance). Looking back now, I feel genuinely privileged to have been ‘young’ throughout the ’90s. Late ’97 to early ’99 I still see as the longest fallow period of the ’90s – the best stuff was from the dance field, with some ‘post-Britpop’ (SFA, Cornershop, Divine Comedy etc) scattered. The post-Spice pop music designed for kiddies (Billie, B*Witched etc) didn’t appeal to, and the ‘alright’ stuff (Robbie, Natalie Imbruglia, Texas, Lighthouse Family even) was playlisted to death on the radio ’til I couldn’t stand any more. The Fatboy Slim singles of ’98 were exemplary, but Praise You is a track I love unconditionally – it’s construction is clearly the work of someone who loves and understands music. It has a subtlety and breathing space in it that is unimaginable in the pop charts just 15 years later. And then there’s the video – I don’t see that as arch whatsoever, it struck me from the first time I saw as absolutely inspired – a remarkably deft and entertaining way of presenting this oddball yet lovely single to the world. Call me a freak, but even now I feel inclined to stand up and copy the moves. Praise You, for me, encapsulates something about the essence of 1999 that is almost intangible now (ditto, for me, Race For The Prize by The Flaming Lips, the entire Mercury Rev album, most of the tracks on that summers ‘Pete Tong Essential Mix (Ibiza)’ and those orange-lens glasses they were selling in River Island that year). 9 is pushing it – but the case has been made well. It really must have been a shock to hear the not-breakdown at the time, and even now it fits – the sort of song I can very happily turn on, tune in, and flap along to without a care in the world. The comparison with Moby’s Play is an interesting one, because like much of that album, this seems like it spent years being plastered over ads and as incidental music on TV sports programs, etc. The connection with baggy stuff is interesting, something I hadn’t thought of (but fair enough), because this primarily reminds a bit of the plastic post-indie pop scene of the late 1990s, things like Len’s ‘Steal My Sunshine’ or Smash Mouth (the mention of Eels in the comments above is fair enough too). I suspect the link between Fatboy Slim, and, say, Len may well be his remix of Cornershop’s ‘Brimful Of Asha’ – I feel it has a similar vibe to this. But obviously ‘Praise You’, while having the vibe of that remix, doesn’t have its pop song structure – instead it has something the internal logic and structure of post-Chemical Brothers electronica/big beat. In Austalia, each of ‘Rockafella Skank’, ‘Right Here Right Now’ and ‘Praise You’ got to about #30 in the charts, and each spent about 3 months in the charts. Which is respectable and all, but of course the album was what was selling – ‘You’ve Come A Long Way, Baby’ stayed in the top 10 in Australia for the entire first half of 1999. Comment number 9 about “making music on computers” is quite funny, but I think Fatboy is/was actually pretty low-tech – samplers yes, computers not so much. Praise You sounds much more like a collage than a copy/paste anyway, and charmingly human compared to, say, an Avicii track from this year. One of the more bizarre moments from 1999’s MTV Video Music Awards featured Norman Cook being sheepishly unveiled from under a giant drape to mime the piano hook to this song while the fictitious Torrance Community Dance Group danced around him led by Spike Jonze in Acting mode. Nine years on from ‘Dub Be Good To Me’ and while perhaps ironingly the 90s most consistent chameleon, Cook’s intentional inadequacy as a pop star and/or lynchpin of a now fading ‘Electronica’ push Stateside was paying off in ways it seemed no-one foresaw. #4 right about the slowburn success of ‘Play’ – somewhat in tandem with ‘The Man Who’ by Travis. The vocal sample here is taken from Camille Yarbrough’s ‘Take Yo Praise’. In an interview around this time (which I can’t find) Norman said that he’d found the sample in an otherwise unremarkable song and made something better with it. A TV company then tracked Ms Yarbrough down to tell her what that naughty Mr Cook had been saying about her song (aaaand I can’t find this clip either, so you’ll have to take my word on it.) Thing was, Norm was basically right, Take Yo Praise is a bit of an aimless jam for the most part (the other tracks of hers I can find are much more interesting – check out But It Comes Out Mad) while Praise You is simply a shower of golden joy for what was and what had been before. I loved this at the time; who didn’t? And I was ecstatic that Fatboy Slim had made it to the top of the tree; The Rockafeller Skank was the sound of my 1998 and You’ve Come A Long Way Baby was a Christmas gift from my sister for my first ever CD player (yeah, I was way late to that party). But… considering the stuff of his that didn’t make the top spot (more on that story later), I can’t help but feel that this is his Manics moment, getting to Number One with precisely the wrong song. I mean, it’s alright and all, it’s well put together (quote Cook on the Yarbrough sample: “bless her, she sung the first verse a capella!”) – although the ending is awful, where he clearly runs out of ideas and doesn’t know how to wrap up so it just sort of stops – and the video’s funny the first couple of times you watch it, but it ain’t The Rockafeller Skank, is it? 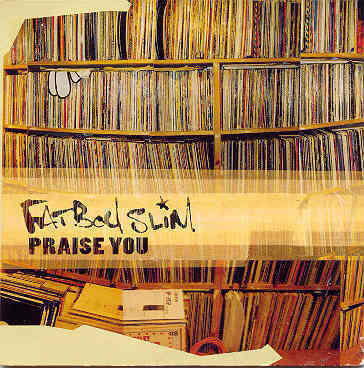 #18 and #9; the most impressive thing about Fatboy Slim’s stuff is exemplified by the cover art for this song. He’s not a guy sat behind a computer, he’s a mad record geek. I remember watching a C4 show called All Back To Mine, where somebody went round to his house and they chatted about his collection (kind of a televised Desert Island Discs; that cover art depicts some of it), and he even cut a couple of bits together to show how it all worked. No computers, just a crapton of records and some decks. Probably why I immediately preferred Slim over the Chemical Brothers, who always sounded more computer-y. Glorious stuff from Mr Cook, and an 8 from me. On checking to see if this has made it into the Reader Top 100 (it was one of a couple of 1999 tracks that I thought might): yes, there it is, several places above Beats International. “Play” definitely had a ‘template,’ gospel samples to an almost never changing piano riff…he then milked it even drier on 18. Still have a soft spot for both albums, but they are both very much of its time. I loved this at the time and it felt like a certain Number 1 given the momentum Cook had for the best part of a year by early 99. This felt like the crowning glory and almost every FS was a thrill given that you didn’t know what was coming next. Also you couldn’t avoid it as it was tailor made for the likes of TV promo’s/adverts/Fifa 99 etc.Even I was aware of Skint records. FS seemed so ahead of the curve at the time but now Praise You has dated quite a bit whereas Rockafeller Skank sounds utterly timeless. Might have been a 10 in 1999 but overfamiliarty to it now brings it down to a 9.Never was that keen on the video at all.